This book presents the most up-to-date and comprehensive guide to the current and potential future state of weed science and research. Weeds have a huge effect on the world by reducing crop yield and quality, delaying or interfering with harvesting, interfering with animal feeding (including poisoning), reducing animal health and preventing water flow. They are common across the world and cost billions of dollars’ worth of crop losses year on year, as well as billions of dollars in the annual expense of controlling them. An understanding of weeds is vital to their proper management and control, without which the reduction in crop yields that they would cause could lead to mass starvation across the globe. Topics covered include weed biology and ecology, control of weeds and particular issues faced in their control. Authored and edited by internationally renowned scientists in the field all of whom are actively involved in European Weed Research Society working groups, this succinct overview covers all the relevant aspects of the science of weeds. 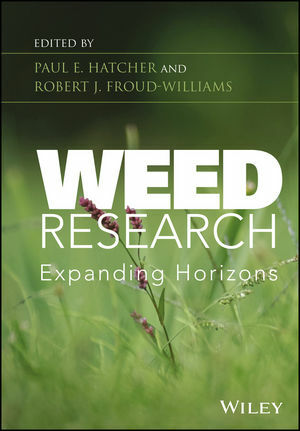 Weed Research: Expanding Horizons is the perfect resource for botanists, horticultural scientists, agronomists, weed scientists, plant protection specialists and agrochemical company personnel. PAUL E. HATCHER is Associate Professor in Applied Ecology in the School of Biological Sciences at the University of Reading, working on perennial weed control and biological control of weeds and insects. He has been a member of the EWRS since 1993, and was Chair of the EWRS Biological Control working group for many years. He is Chair of the Editorial Board for the Wiley-Blackwell journal Weed Research, and a member of the Board of the EWRS. He is also a member of the DEFRA steering group on weed biological control. ROBERT J. FROUD-WILLIAMS was Senior Lecturer in Weed Science in the School of Biological Sciences at the University of Reading and has research interests in weed ecology, agri-environment and integrated weed management. During his career within the university he supervised more than forty postgraduate students. He has been a member of EWRS since 1980 and was elected Vice President in 2001 and President in 2003 in addition to his former role as National Representative. He has been a member of several external committees including BCPC Expert Weeds and for eighteen years was Chairman of the UK Weed Liaison Group representing publicly-funded weed science in the UK. He also was member of various committees including Defra Sustainable Arable Link, Association of Applied Biology Weeds and Agronomy Group, member of the advisory board for Aquatic Plant Management Committee and steering committee of the Arable Plants Group within Plantlife.